Tonight Alive’s newest album ‘Underworld’ is the labour of a long and emotionally distressing time (and by extension – whole, financially successful but draining career) for lead singer Jenna McDougall and the band. She has commented on the writing of the album saying “The album is called Underworld and I named it that because it reflects the ugly parts of me that I wasn’t ready to see til now.” This sentiment is clear in the single Disappear sung by Lynn Gunn of PVRIS whose vocals, unlike many pop songs, begin the song with great clarity ‘Faceless, underwater, we can disappear for a while’. McDougall’s lyrics continue with this dual metaphor of disappearing and being underwater with brilliant lines like “Sinking down, thought I lost myself, but I didn’t. Looking up on us, Shadows dance above. Blurry vision. We could disappear for a while”. Far as we’re concerned, the only way to be free – to stop being dragged down by the waves, is to disappear. While the lyrics are incredibly praiseworthy, I found the music to be slightly lackluster. Not that it was a bad song, it’s very catchy and very upbeat but it’s largely just that – no curveballs in sight, just straight, heavy rock. Which, honestly, is what I think the band were trying to do with this song. Lynn Gunn is an interesting choice to feature because while just as experienced as McDougall, the personal nature of the lyrics as well as the fact that Gunn’s performance is not as aggressive as McDougall’s means that Disappear has a lot less impact than it could if the lyricist also sang her own song. This is not a criticism of Gunn’s performance, she did great and is in general a great singer but I also can’t help but really want to hear Jenna McDougall do a version of Disappear and see whether there will be a difference. For all the heavy rock lovers, this song should be absolutely flawless, with both astounding lyric writing and performance but for those looking for experimentation, this might not be the song for you. 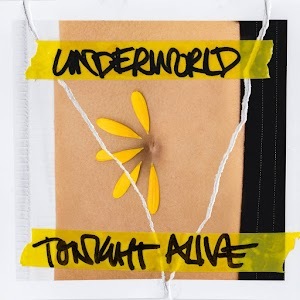 However, luckily for those of us who want just a little more, Underworld includes two more singles (For three in total for which I would give Disappear a silver medal). These two singles Temple and Crack My Heart are both sung by McDougall whose emotional performances give sincere gravitas to her lyrics. Temple, which is actually the lead single, is by far my favourite of the three (also the catchiest and hasn’t left my head in days). The extremely personal lyrics were written while in McDougall was in Thailand sick with sudden allergies to just about every type of food. Being unable to eat and feeling physically, emotionally and spiritually unwell, McDougall described her experience as “helplessness and the desperation of trying every single possible remedy and being on the phone multiple times a day to different doctors trying to get some sort of diagnosis”. The song is a brilliant reflection of her experience, the mixing on the vocals are compressed to the point of feeling cramped; the melody is rhythmically and tonally all over the place, matching but separating from the backing instruments at the same, especially in the opening of the chorus “I do not think you heard me when I said, ‘My body is a temple, tell me why it hurts like hell’”. The three singles are available for streaming on Youtube and honestly do not disappoint. They’re great tasters for the album which is available for purchase on iTunes, Spotify and the Tonight Alive official store.